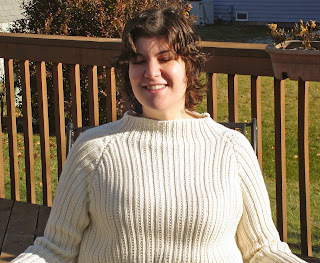 As I promised in the last post, here is the pattern for Bandersnatch, a sweater I designed last year. This is my first full scale sweater design. I am finding this sweater very comfortable to wear; I think it looks as good on as it feels. I have noticed that ribbed sweaters are flatttering. This sweater flares sweetly at the bottom edge for modesty of the belly, yet the stretchy ribs form themselves to body countours without any tightness. The beaded rib pattern adds a touch of fanciness to a simple design, and the cotton/cashmere blend yarn is super soft. No special edging is needed because the ribs form their own non-curling, non-binding edges. It looks good on everyone who wears it. Bandersnatch is my attempt at a wearable design with fit and construction conventions mimicking ready-to-wear. I have become more aware lately of fit in hand knitted design and more interested in solving the fitting problems that I have encountered. Sometimes, for example, hand knitting patterns give too much leeway and gape at the neckline or fall off the shoulders. I am learning to compare my own fit requirements more closely to those of the knitted pattern. Although designed for me, this sweater will fit anyone. It represents few chances for poor fit because of the flexibility of its ribbed fabric. I sized it for a range of sizes, but precise matching of body measurements is not needed. 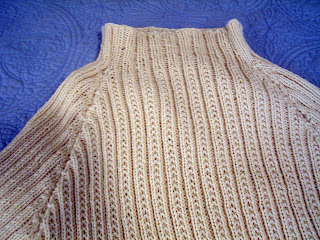 The finished sweater measurement is taken with the fabric unstretched and might be smaller than corresponding body measurements. This is not negative ease, but a function of the sweater's stretchiness. Note that I was unable to publish my schematic chart (which I painstakingly taught myself to draw) in Google Pages. I tried it both as a word and a pdf document, and the lines would not show up. So at the bottom of the pattern, I listed the finished measurements of each piece. Not as easy to read, sorry, but the information is there. 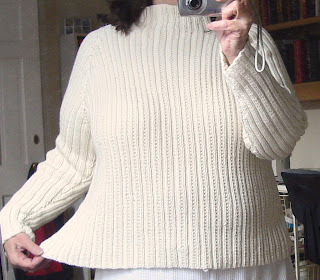 A note on the sweater's name: I sometimes name my knitting projects for the audiobook I listened to as I knit it. When I made this sweater I was listening , not to Alice in Wonderland, but to The Frumious Bandersnatch by Ed McBain, a police detective crime novel. Thanks so much for the pattern. 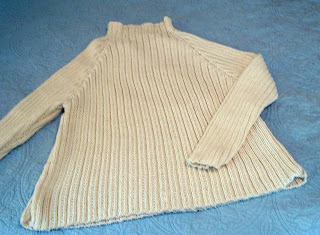 This is exactly the sort of sweater that I like -- raglan sleeves, simple but elegant stitch pattern, high neck, cotton-blend DK yarn. Yum! I made a sweater with a knit, slip, knit and slipped the slips on the purl, for dh one time but yours is ever so much more elegant. Thanks!